My Guild meets in the fellowship hall of a local church. The church had recently installed a new electrical panel front and centre above their coffee counter. The Guild was asked if someone would be willing to create something that would cover that electrical panel. Along with two others (Catherine, Shirley and Deborah) I stepped forward. Yes, yes I know I have other projects to finish, but remember my word for 2015 is BEGIN. So I began another one. 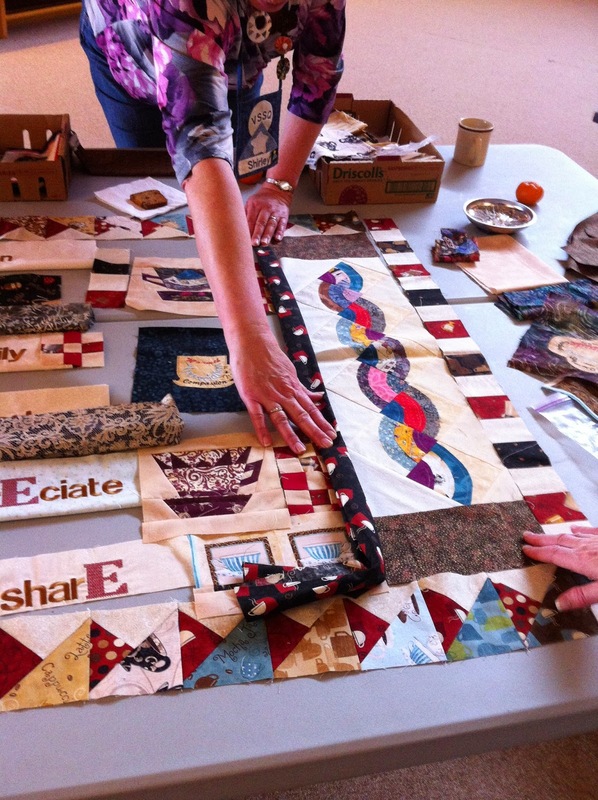 We started with orphaned blocks that were left in the Guild's "scrap stash". I thought they would look good along the borders. We measured and measured again and determined what was needed was a rectangular piece. 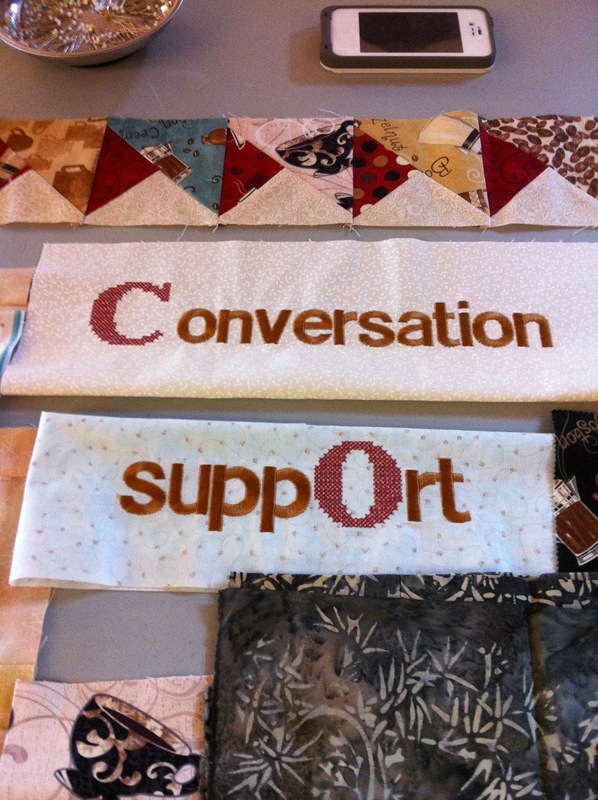 Using some coffee themed fabric we stitched additional borders. They're marked "2" and "3" in the picture below. Yes that's right...we were working from the outside in. 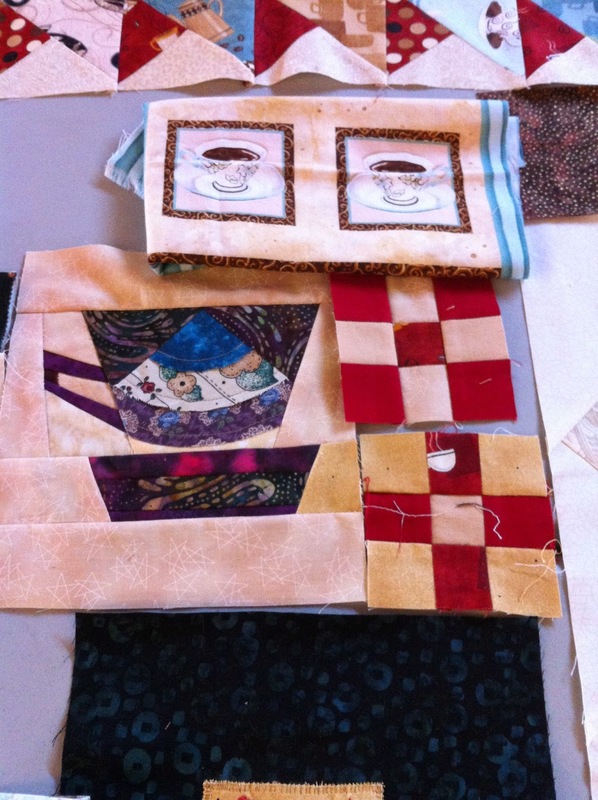 Next came some simple nine patches for fillers and paper pieced coffee mugs. We now needed something to tie all the pieces together. Shirley experimented with machine embroidery. She had chosen a wonderful way of doing some embroidery so that it formed a sort of "crossword" centre. Notice that certain letters are capitalized? You'll see in a minute why she did this. 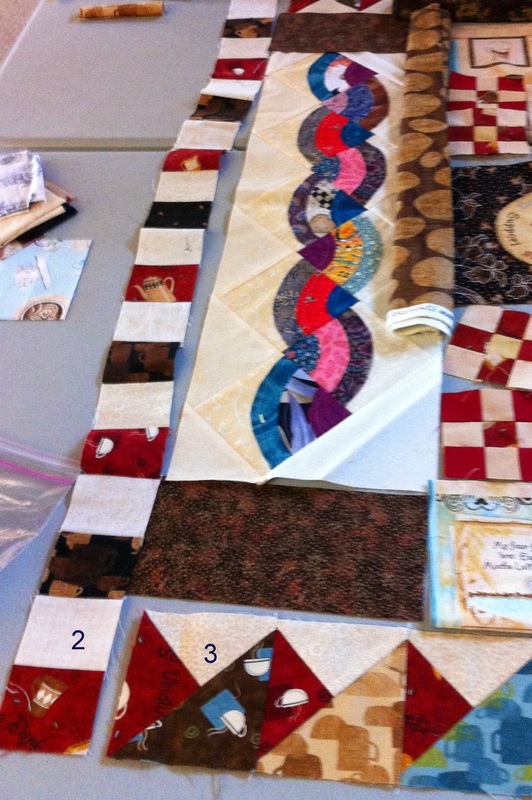 We needed something more to fill in the spaces; some pieces were fussy cut and others simple fabric squares. Here is Catherine auditioning fabric for additional sashing. 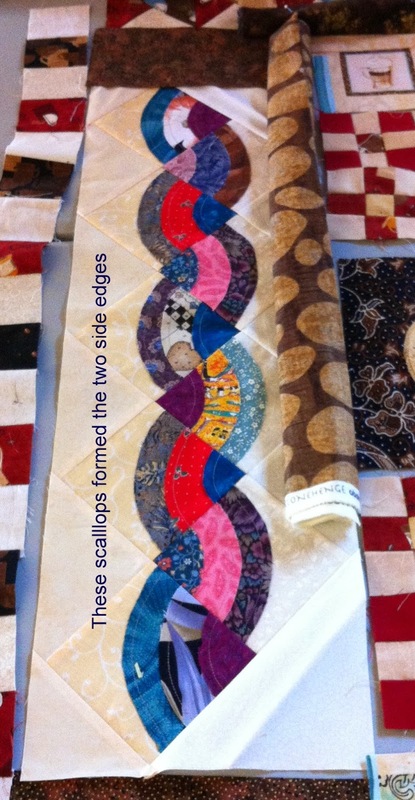 With some additional piecing, the top was finally ready for sandwiching and some fancy free motion quilting. Deborah added her flair and VOILA!!! Done and presented to the church. 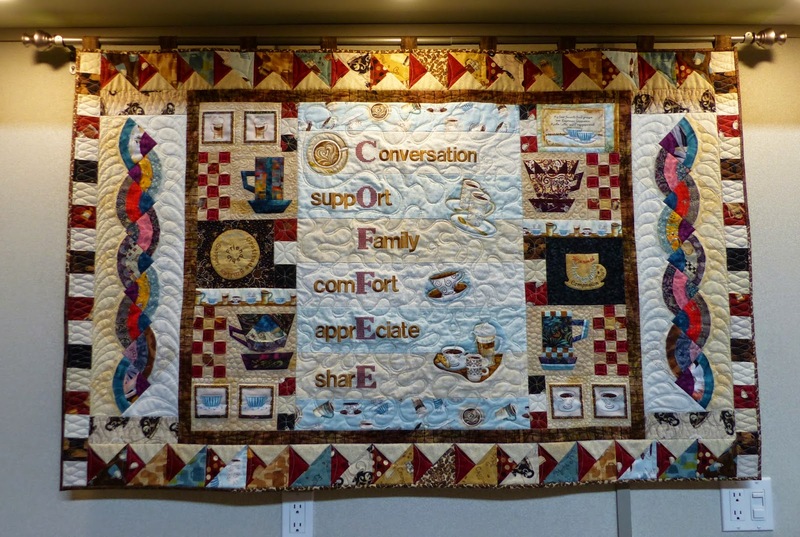 Here is the completed wall hanging. The wall hanging is centered over the electrical panel and can be easily slid out of the way if the panel needs servicing. Oh yeah! See how the capital letters spell out "COFFEE"? It was challenging working from the outside into the centre. When it was presented this month, the pastor and staff's eyes glistened and smiled. It was an enriching experience. You all rose to the challenge! That's a great wall hanging. Fabulous.....from beginning to finish. Great job! Really nice way to cover up something unsightly. Good job. Creative!